The biggest rocket ever to launch from the US West Coast has lifted off from Vandenberg Air Force Base. 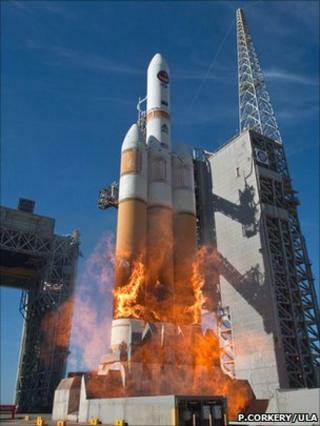 The 72m-high Delta IV Heavy was carrying a classified satellite for the National Reconnaissance Office (NRO). It has previously only operated from Florida, and the launch pad at the Californian base had to be upgraded to handle the giant vehicle. Flying the Delta from the West Coast allows the largest reconnaissance satellites to be put into polar orbits. The vehicle is reserved for military and intelligence use, although there has long been discussion about modifying it for a role in human spaceflight. The Delta IV Heavy features three core boosters strapped side by side. Each has a Pratt and Whitney Rocketdyne-built RS-68 engine. These motors burn a tonne of propellant every second and produce 2,950 kilonewtons (663,000lbf) of thrust at lift-off. This was the fifth flight in the vehicle's history, and the second in just two months. No details were released about the payload. The NRO operates satellites that return information to the Central Intelligence Agency and US Department of Defense. Large imaging satellites of the type the Delta IV could launch would have remarkable resolution. Vandenberg's position on the coast means the Delta can fly south over the Pacific and avoid crossing land as it climbs skyward. The last heavy-lift rocket to launch from Vandenberg was the Titan IV-B in 2005. The extra performance of the Delta enables it to put a further tonne of payload into low-earth orbit compared with the Titan. Thursday's launch took place at 1310 Pacific Standard Time (1610 EST; 2110 GMT). Some $100m had been spent upgrading the SLC-6 launch pad.